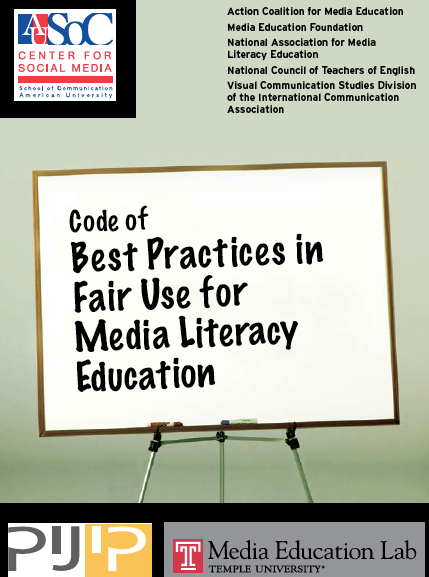 In 2009, the Media Education Lab worked with the Center for Social Media at American University to produce three case study videos featuring prominent examples of fair use of copyrighted materials in elementary, secondary, and higher education. Rhys Daunic’s film about his own experiences with media literacy organization, The Media Spot, shows how students as young as 8 years old can understand their rights to use copyrighted material under fair use. In the high school vignette, technology coordinator Kristin Hokanson turns a copyright holder’s “copyright confusion” into a powerful lesson for her students. In the college vignette, the founders of Project Look Sharp at Ithaca College respond to Newsweek‘s request that they get Osama bin Laden’s permission to reproduce his photograph in their curriculum materials. Learn more about copyright and fair use issues at the Media Education Lab or the Center for Social Media.